My sister Hala, who also loves cooking and dinner parties, was telling me that Risotto is not a popular dish in Lebanon. I don’t know how true is this, but I know that I only love it when served immediately. This is one of the dishes that can’t be successfully cooked in advance, which makes it difficult to consider serving when I have guests for dinner. It’s so easy to make a good risotto, but make sure that you choose short-grained plump rice, such as Arborio, Carnaroli or Vialone Nano. The only way to make risotto is to stand over it until cooked. DO NOTHING else! Not really evident in my case where Axel is shoving her head between my knees to carry her and Kaia is constantly asking me to come and play with her and Polly Pockets. The hot stock is added little by little until rice is soft and creamy. This will take you around 20 – 25 minutes, for this amount of time at a hot stove, it’s really worth to use the appropriate rice. 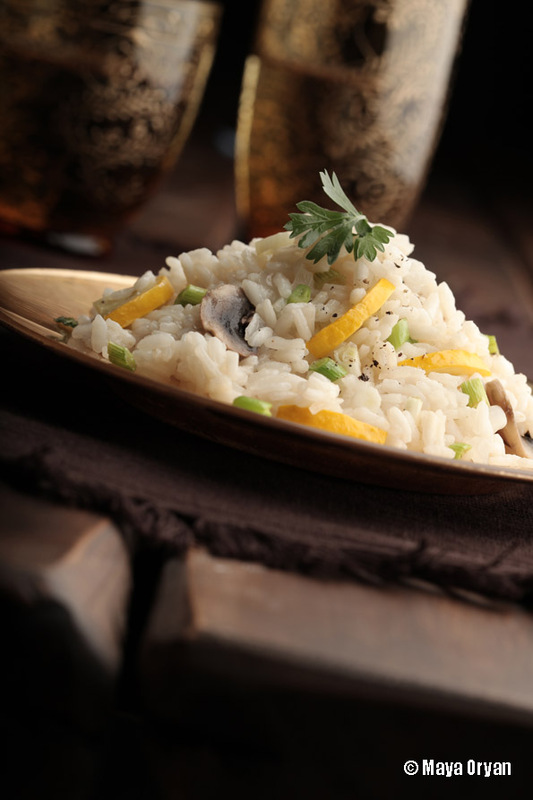 Risotto can be combined with any vegetables you like or also seafood. The best risotto I ever had was cooked with champagne instead of wine, and used asparagus instead of zucchinis. I didn’t have any asparagus today and didn’t want to open my pricey bottle of champagne:), but I do recommend that you try it. 1. In a medium saucepan, place the mushrooms and the zucchinis with olive oil and sweat until cooked. Season with salt. 2. In a separate heavy bottomed pan, heat the butter and add the onion, stirring occasionally, until soft and transparent. Add in the rice and cook, for 2 minutes. 3. Mix in the wine to the softened onions and cook until the liquid has evaporated off. 4. Pour in 1 cup of the stock to the onions and rice and cook, stirring occasionally with a fork, until liquid is almost absorbed. Repeat this process until rice is thick and creamy; the rice should still have some chew to it. Season to taste. 5. If the rice is still hard do not add water. It has to be cooked with additional stock. 6.Once the rice is cooked, mix in the vegetables and add Parmesan cheese and serve immediately. This entry was posted in Main Course, Recipes and tagged black peper, food photography, Food Stylist, italian dishes, italian food, lebanese food blogger, Maya Oryan, middle eastern food, mushroom risotto, risotto, zucchini risotto by Maya Oryan. Bookmark the permalink. This sounds and looks like a really great risotto.It’s been cooked very well since it;s not too gloopy.